As the second part of a VIP Louvre Museum Night Tour and Wine Tasting offered by City Wonders, Paris has become even more interesting when a small group walked from an educational and highly interesting 2.5-hour tour within the Louvre to take a seat at the long wooden table within the historic stoned basement of O’Chateau. The history of O’Chateau is one filled with stories of its guests — dukes, ambassadors, princesses, countesses and all variety of important thinkers and writers of the time. Tonight, however, we are all VIP’s enjoying three wines and a plate of cheeses and hams while we learn about a few wines of France. The first wine, an elegant Saumur 2012 cuvee vent du nord, was explained by the wine instructor, and the group listened intently about the regions within France from where each wine hailed. This chenin blanc grape was fruity and fresh, medium bodied and average. But, with the cheeses and jambon to which it was paired, worked perfectly. O’Chateau wine tasting with City Wonders tour. Next, a lesson in Beaujolais, France. 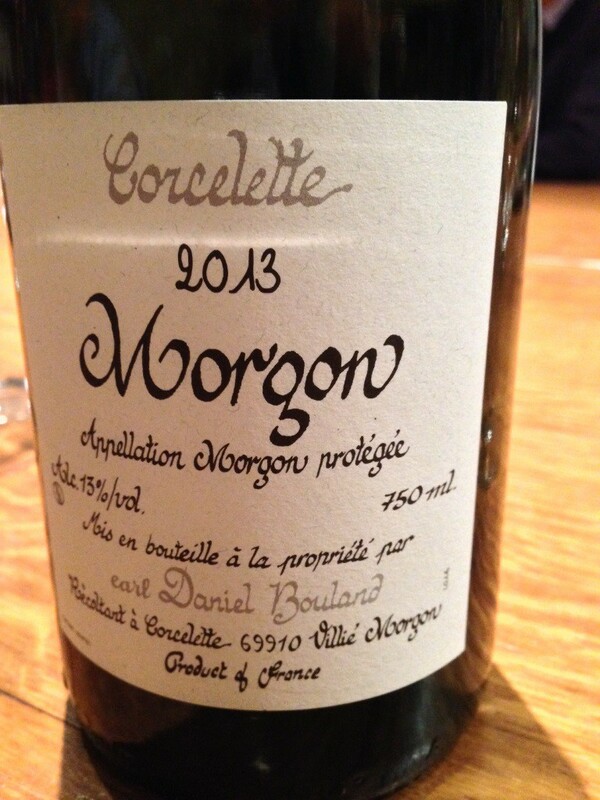 This Corcelette Morgon 2013 is a wine made with a grape of the southern wine growing region in Burgundy and is referred to as its own appellation and not in the same category of Burgundian wines. It is light and dry, and we we are instructed to swirl and gaze at the ruby color of this gamay grape. We are enthralled in the process of tasting wine and devouring the cheeses and hams before us. Finally, the malbec is poured. This is a 2012 Combel La Serre Cuvee Originelle Cahors from SW France. The instructor indicates its spiciness and bit of tobacco kick in the teeth. This is a wine that sells for around $10, and pairs best with beef and spicy food, mature and hard cheeses, as well as poultry. If you can find a 2010, this would be the better vintage. So, the tasting was short and sweet, er… dry, actually if you refer to the wines, and after the closing of the tour, many in the group head upstairs to order a bottle of wine and food from the menu. At 10 p.m., the night has only just begun in Paris. Visit http://www.citywonders.com/en/france/paris/paris-tours/louvre-tour-night-paris-wine-tasting to reserve your spot for a Skip the Line tour through City Wonders.